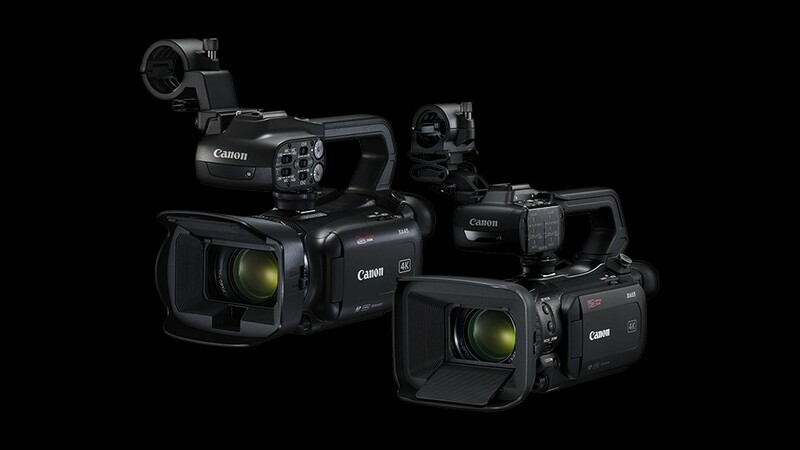 Canon XA40 4K Camcorder – price $1,699 – pre-order at B&H Photo Video/Adorama. Canon XA45 4K Camcorder – price $2,199 – pre-order at B&H Photo Video/Adorama. Canon XA50 4K Camcorder – price $2,199 – pre-order at B&H Photo Video/Adorama. Canon XA55 4K Camcorder – price $2,699 – pre-order at B&H Photo Video/Adorama. Canon VIXIA HF G60 4K Camcorder – price $1,699 – pre-order at B&H Photo Video/Adorama/Amazon. The Vixia HF G60 features a 1″ 4K UHD CMOS sensor with 8.29MP resolution and a 15x Optical zoom lens that supports 4K capture throughout the entire range. However, what makes this a step up from the Vixia HF G50 are the 9-blade iris, which reduces the streak or star effect on specular highlights for a more natural-looking image, and the Dual Pixel CMOS AF functions originally developed for Canon’s professional cameras. The Dual Pixel functionality supports Touch AF and Face Detection AF, as well as the Dual Pixel Focus guide that provides a visual readout on the screen of where your plane of focus is. The four new professional cameras are built around two different sensors. The XA50 and XA55 feature a 1.0″ CMOS sensor and 15x optical zoom, and they are compact, lightweight, and well suited to the professional production environment. In addition to different sensors between the two series of cameras, autofocus capabilities differ, too. The XA50/55 offers Dual Pixel AF and Contrast AF, while the XA40 and XA45 feature Hybrid AF, Normal AF, Face Only AF, Manual Focus Hybrid AF Controls, Instant AF, and Canon’s Medium AF. All four cameras shoot UHD at 29.97 and 23.98, making them suitable for use in broadcast or cinema-style productions. For legacy productions, the camcorders support recording 1080p at 59.94/29.97/23.98. and they each incorporate a mini-HDMI terminal for output. The XA45 and XA55 also incorporate a 3G-SDI output jack, making them more suited for SDI productions than the XA40 and XA50, which do not have SDI capability. A wide range of accessories is available for both series of camcorders and, with dual SD card slots, the cameras are ready to start working for you with a minimal learning curve. Previous Previous post: Canon VIXIA HF G60 4K Camcorder Leaked Images, to be Announced Soon !